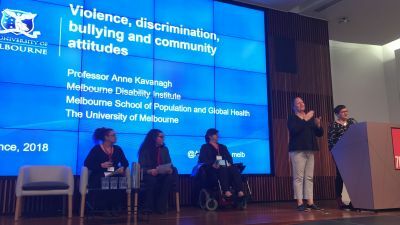 Professor Anne Kavanagh presented the keynote at DARU's Strengthening Disability Advocacy Conference in Melbourne on 14 September 2018. The presentation highlighted academic research by the Disability & Health Unit, the CRE-DH and affiliates on bullying, discrimination and violence experienced by people with disability. She also spoke about forthcoming research on attitudes toward people with disability. In her address, Anne shared the stage with our team of co-researchers Vas Kasidis, Jasmine Ozge, and Georgia Katsikis, who worked on the Community Attitudes Survey. The Survey of Community Attitudes toward People with Disability was a national survey, partially funded by the Victorian Department of Health and Human Services, to provide data on attitudes that can be used as a baseline of evidence for future monitoring. 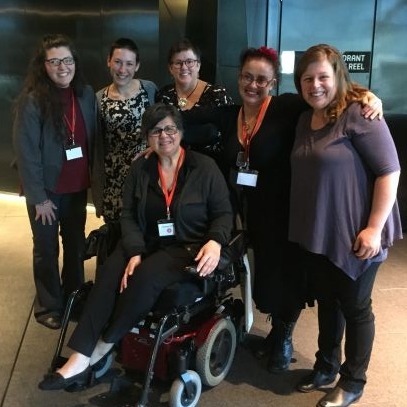 Vas, Jasmine and Georgia shared reflections on the survey co-design process and the benefits of involving co-researchers with lived experience of disability in the research about them. Vas outlined the ways that co-researchers were involved in the Community Attitudes project, including co-design of survey content, seeking feedback from stakeholders, and contributing to the interpretation and reporting of findings. She explained how inclusive research redefines traditional power differentials in academic research, while also adding to the quality of the research itself. Jasmine talked about co-researchers’ experiences interviewing stakeholders in disability advocacy and activism. She illustrated how stakeholder feedback not only helped shape survey content, but was also a rich source of qualitative data that helped guide interpretation of survey findings. Georgia stressed that, because inclusive paradigms have gained traction as a research “trend,” members of the disability community have an unprecedented opportunity to contribute to the production of research, and to help make inclusive research a mainstay. and that exposure to these forms of mistreatment are associated with poor outcomes. Together, this data offered insights at several nodes along a continuum where attitudes, discrimination, and their consequences connect, creating inequalities for people with disability across health, social and economic domains. Conference delegates contributed to a lively Q&A session following the talk, in which Anne, Vas, Jasmine and Georgia entertained questions as a panel. Anne asked how academic research can better support work in the disability advocacy sector. Suggestions from the audience included a call for academic researchers to be available to testify as expert witnesses for court cases, and for data analyses to examine variations in outcomes by region (metropolitan versus regional and remote) and by sexual orientation.